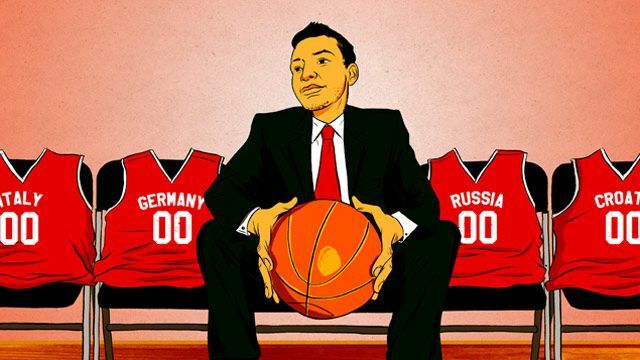 » Is the NBA Done Drafting International Players? It all started in the summer of 1992. That’s the line you’ll hear from most everyone — scouts, players, coaches both foreign and domestic — whenever you ask for the moment basketball became a global game. While it had long been popular in places like the Baltics, the Balkans, and the Philippines, the sport had few fans in other pockets of the world until the Dream Team’s summer of smiling, sanitized dominance. While Michael and Magic and Larry made their historic run, a woman named Meriem Moktaa Fournier sat at home in Saint-Maurice, France, 665 miles from Barcelona. Pregnant with a son she would name Evan, she had taken a break from her competitive judo career. Three months later she would give birth, bringing Evan into a world in which the Dream Team had already won gold, where Parisian blacktops were already teeming with wannabe ballers, where his path to the NBA was already being paved. He would spend his teenage years playing against his continent’s best — boys from Spain and Serbia and the Czech Republic and beyond. They would all believe they were destined to be the next Tony Parker or Pau Gasol, or at the very least, the next Vladimir Radmanovic or Goran Dragic. The NBA would welcome them. By now, it had been welcoming their compatriots for years. If Fournier slips out of the first round,1 and if no other European prospect vaults up draft boards to replace him, then this would be the first draft since 1992 — about a month before the Barcelona Olympics began — with no international first-rounders.2 Some see this as nothing more than a historical fluke, while others blame last year’s lockout or this year’s strong crop of collegiate prospects. Still others point to Europe’s economic woes or to lingering effects of long-ago wars. But even if this year is an aberration, a longer-term trend persists. Assuming Fournier is the lone first-rounder, that will make 20 players from outside North America chosen in the first round in the last five years, down from 36 in the previous five-year period. So after years of unchecked player migration, has the impact of foreigners begun to decline? Foreigners have been in the league since the beginning. Henry Biasatti, an Italian-born Canadian, played in the NBA’s first-ever game on November 1, 1946.3 Seven years later, a Vancouver native named Bob Houbregs became the first non-American to be chosen in the first round of the NBA draft, going second overall to the Milwaukee Hawks. But through the first several decades of its existence, the league was composed almost entirely of Americans. You either have an eye for talent or you don’t. You can do all your homework and have everything properly organized, but when it’s draft night and you’re on the clock and your coconuts are on the table — when it’s nut-cutting time, as we say — that’s when you separate the boys from the men. In the 1973 draft there was Swen Nater, a Holland native who moved to California as a boy, eventually playing for UCLA and seven different NBA and ABA teams. Through the ’80s a number of other foreign-born players used the NCAA as a springboard to the league — guys like Hakeem Olajuwon and Detlef Schrempf and Rik Smits. And then there was Georgi Glouchkov, a Bulgarian who came to the Suns in 1985 but then went home a year later, hounded by rumors of steroid use and overwhelming evidence that he just wasn’t very good. Nelson leans back in his office chair, flanked by Mavericks player personnel staffers, deep in the bowels of the American Airlines Center. He’s surrounded by printouts and markers and whiteboards covered top-to-bottom with prospects’ names, all signs of the chaos that must be made orderly by the time draft night arrives. But for now, he takes a break from thinking about who the Mavs will take with the 17th pick and reflects on the last two-plus decades of the NBA’s international relations. 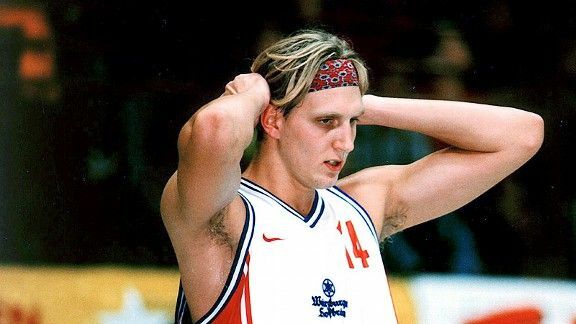 By his fourth season, Nowitzki was an All-Star, well on his way to a Hall of Fame career and already drawing comparisons to Larry Bird. Suddenly, everybody wanted their very own Dirk. And, the thinking went, all they had to do was head over to Europe and find one. Unlike the generations of players before him, Fournier grew up in a flattened, post-nationalist European basketball culture. Sure, he appreciated Parker’s Spurs, but his all-time favorite NBA team remains the 2002 Kings. “I still can’t believe they lost that (Western Conference finals) series to the Lakers,” he says. “That was the series that made me love basketball.” Today, when Fournier wears the number 10 on his jersey, he does so in honor of his favorite player: Mike Bibby. Fournier’s story is not one of a childhood spent dreaming of riches and glory in a faraway land. He was not plucked from obscurity or given his big break by an intrepid and eagle-eyed scout. Instead, Fournier’s tale sounds more like the biography of any number of players from Brooklyn or Atlanta or Compton. He played and he grew and he developed, always believing the NBA was within his grasp, until one day, it became clear, he was right. Had he been born 10 years earlier, this probably wouldn’t have been the case. By the early 2000s, NBA executives had begun coveting European talent, but they still hadn’t figured out how to effectively evaluate it. Few teams had full-time overseas scouts. If they took an international trip and saw a player have a bad game, they wrote him off. If they brought someone in for a workout and he shined, they assumed he’d become a star. The openness to imports was there. The understanding of proper context was not. Despite all the newfound love for foreigners, some still slipped through the cracks. Manu Ginobili went no. 57 in 1999.8 Tony Parker went no. 28 in 2001. That same year, Andres Nocioni went undrafted. “You could still get unbelievable value on players if you really did your homework,” says Pete Philo, an international scout with the Timberwolves who founded the Reebok Eurocamp, which has become a must-visit pre-draft event for NBA personnel. “There was so much misinformation out there, you had to have guys with the relationships and understanding in place. You might have a talented player who’s not performing because he doesn’t fit into the system.9 You can’t write that guy off.” Teams also struggled at times to put players’ performances in the proper context. “When you’re scouting college kids, you can watch your team play one night, and then go watch North Carolina and Duke play the next night,” says Nelson. “The comparison is right there. If you stay over in Europe too long, you’re not used to the athleticism of our league. You’re watching slow on slow. Anybody with any kind of quickness all of a sudden looks like he’s Tony Parker.” For that reason, Nelson prefers to send scouts on short-term trips abroad, with the speed of the league still fresh in their minds. In the summer of 1992, while the Dream Team romped through Barcelona and Meriem Moktaa Fournier prepared to give birth to her NBA-bound son, on the other side of Europe a far bleaker reality persisted. Nelson explains his job this way: “We’re projectors of human beings. Some people project real estate. Some project art. We project basketball players.” Scouts are paid to speculate — to estimate future value of a human asset. So perhaps in the mid-2000s, the NBA just endured a Euro-centric “speculative bubble,” and today’s regression is nothing more than an industry-wide self-correction. Or maybe it’s something even simpler: Scouts and general managers have gotten better at their jobs. He certainly doesn’t want to be back in Europe. Unlike many internationals who stay overseas after being drafted, Fournier can’t wait to move. While sitting in his hotel, he says of Dallas, “It reminds me of Paris,” becoming almost certainly the first person to ever make that comparison. He reflects on what he’s most looking forward to about the NBA: the competition, the facilities, and the fact that he’ll never get called for traveling. And with that, he gets up and walks away, through the cavernous atrium of a faceless hotel in the latest stop on a long foreign tour, back to his room, alone. Editor’s Note: A footnote was added and a sentence deleted after this story was originally published to clarify how complicated it can be to define “international” players in the NBA. Jordan Conn (@jordanconn) wrote The Defender: Manute Bol’s Journey from Sudan to the NBA and Back Again, a multimedia e-book published by The Atavist. The league was then called the BAA, Basketball Association of America. Nowitzki was traded along with no. 19 pick Pat Garrity for Robert Traylor, who never averaged more than 5.5 points per game. Dallas then sent Garrity (and a future no. 1 that became Shawn Marion) to Phoenix in exchange for Steve Nash. Not a bad night for Nelson. The globalization of the game has given rise to a community of basketball lifers/vagabonds, including Nelson, Ronzone, and others. “Guys like me and Tony will go coach a clinic in Nigeria for nothing more than a bowl of soup,” Nelson says. Some of the 70+ stamps on Ronzone’s passport: North Korea, Saudi Arabia, and Sri Lanka, where he was once caught under gunfire from Tamil Tiger rebel forces. Jason Kapono once told reporters that if he moved to Croatia and changed his name to “Kaponovic,” he’d be a lottery pick. Instead, he went in the second round.